Highlands shortstop Steven Martinez settles under an infield pop up. East Central (22-9-2) vs. Brandeis (16-9-3): best-of-3 series: Game 1: 8 p.m., Thursday at Nelson Wolff Stadium. Game 2: 7 p.m., Friday, at East Central. Game 3: noon, Saturday, at Northside ISD Field No. 1 (if necessary). 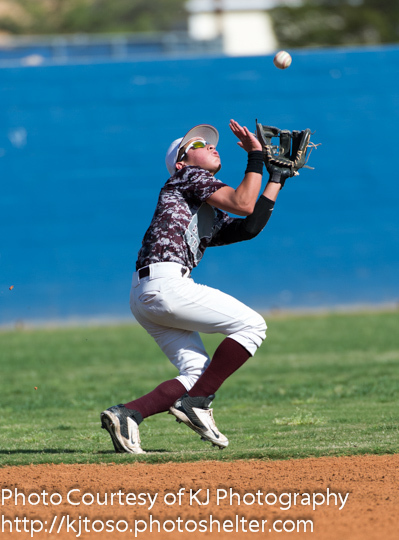 Southwest (19-8) vs. Mission (11-9-1) at Corpus Christi Calallen: best-of-3 series: Game 1: 8 p.m., Thursday. Game 2: 4:30 p.m., Friday. Game 3: 7:30 p.m., Friday. Highlands (16-9) vs. Port Lavaca Calhoun (12-16-1): best-of-3 series: – Game 1: 7 p.m. Wednesday, at Diz Reeves Diamond; Game 2: 5 p.m. Friday, at Calhoun; Game 3: 8 p.m. at Calhoun (if necessary).